Are you planning to stir-fry pork and you’re not too sure which marinade to add? Does the marinade sauce run out of the pork and you’re not sure what to to do? Here are two different pork marinade recipes to try. Both recipes go nicely with ¾ to 1lb of pork tenderloin or pork chops that been cut into cubes or strips. You'll want to marinate the pork for 15 to 30 minutes prior to cooking, so make sure you plan ahead. While the pork marinates, you can clean and chop the vegetables. 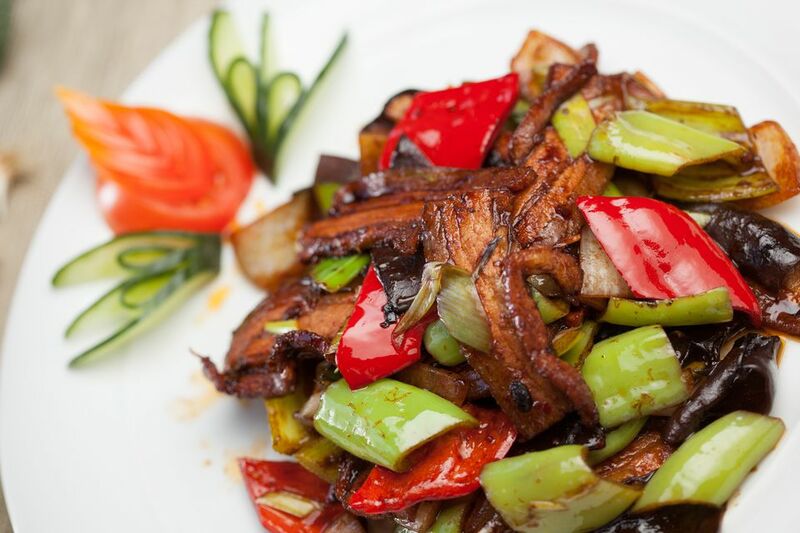 To add some color and nutrients to the dish, different kinds of vegetables can be used to accompany the stir-fried pork. You can use snow peas, baby corn, sliced carrot, bok choy, eggplant, mung bean sprouts, asparagus, peas, green beans, onions, or anything else you have on hand. Just make sure the vegetables are all cut to a similar size. This will help ensure that they cook at the same rate. If you add a decent amount of vegetables in your stir-fry pork, then you can season the stir-fried pork with a little bit of salt to taste. Sometimes the vegetables can taste a little bit plain if you don’t season with salt. You can also add a little bit of water when you stir-fry the pork if you think it’s a bit dry. Finish the dish with a sprinkle of sesame seeds and serve with white or brown rice, your favorite noodles, or as is. After stir-frying, you can also finish the dish off with ¼ to ½ teaspoons of sesame oil but this is entirely up to you. This marinade is very tasty and versatile. It can be used on other proteins besides pork. Try it on chicken strips, beef, or even shrimp. They will all work for stir-fries, but you'll need to vary the cooking time based on the type (and size) of protein you use. If you have a wok, now is the time to use it! If you do not have a wok, don't worry, you can still stir-fry. Use the biggest (and flattest) frying pan you have and get it very hot. To know if it's hot enough to stir-fry, sprinkle a few beads of water onto the hot pan. If they evaporate immediately, the pan is ready for a stir-fry. If not, keep heating. Cut the pork into strips or 1 to 1 ½ inch cubes. Add the marinade ingredients to a bowl, adding the cornstarch last. Give it a good mix then marinate the pork cubes or strips for 15 to 30 minutes before stir-frying. Cut the pork into 1 to ½ inch cubes. Add the marinade ingredients to a bowl, adding the cornstarch last. Mix completely. Marinate the pork cubes in the sauce for 15 minutes before stir-frying.